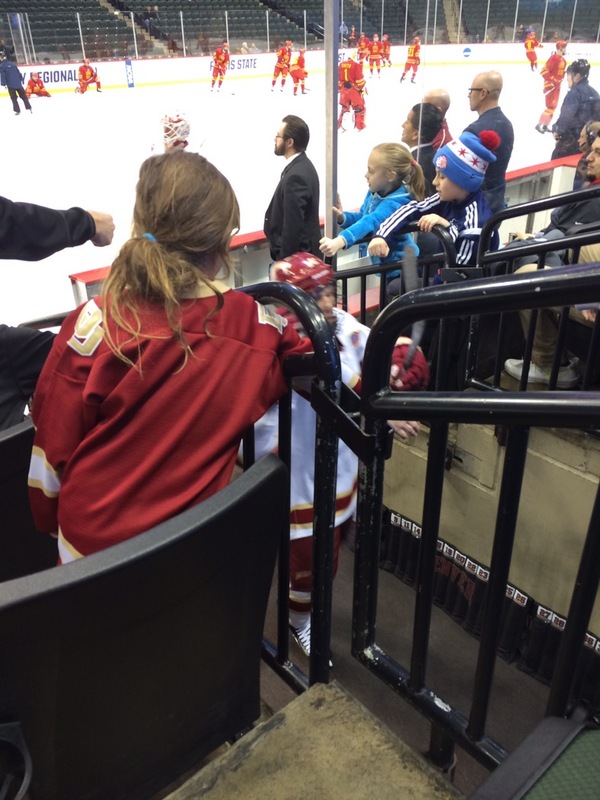 Saturday afternoon the Afthead family enjoyed watching their favorite hockey team, the DU Pioneers, beat Boston University. Our seats were amazing and my kiddo was brave enough to reach her hand out and high five all the big college kids as they went on and off the ice. Her growing bravery makes this momma’s heart proud. 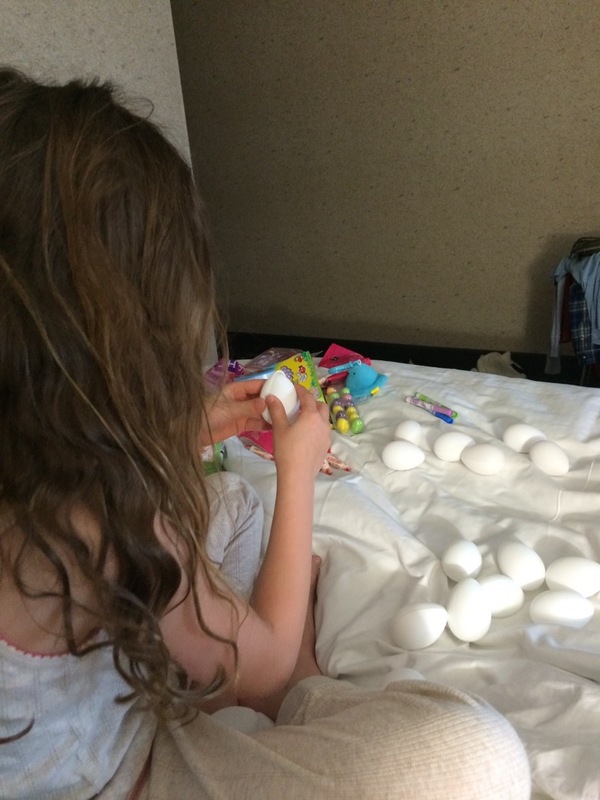 Sunday morning the little Afthead enjoyed a small hotel room Easter egg hunt, followed by a bonus egg hunt at our brunch restaurant. Since she was the only kid in the entire restaurant she rocked that extra egg hunt! 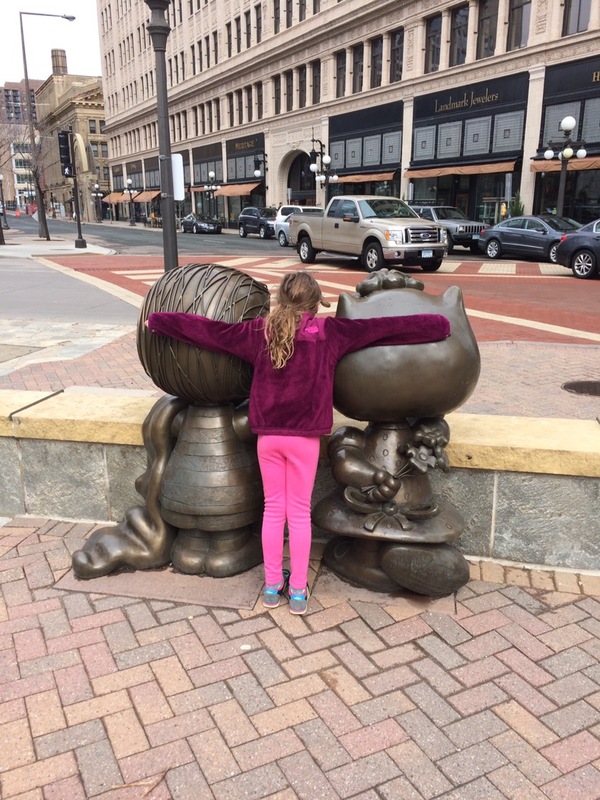 Next, the wee Afthead made friends with Linus and Sally, who had much larger aftheads than she. Off to the Science museum, which is a must visit if you are in St. Paul. 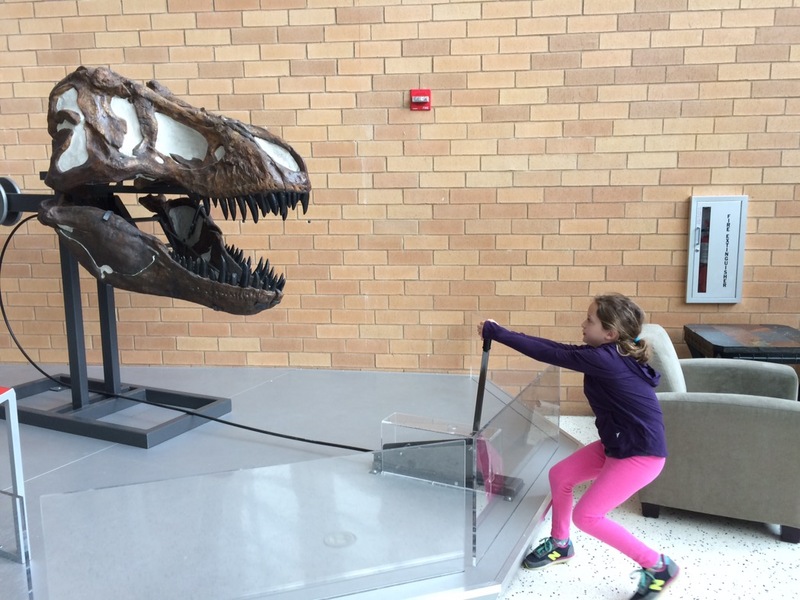 Here the kiddo Afthead controls a T-Rex forehead. Chomp! 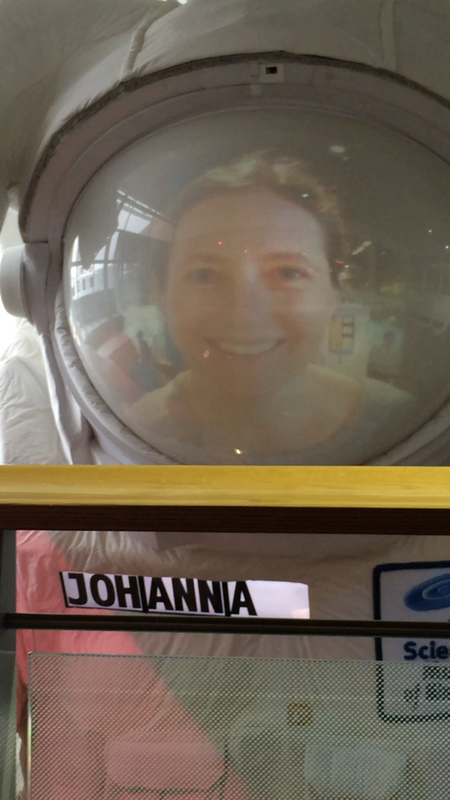 Then another forehead adventure as each of us had our faces displayed on the face mask of a three story tall astronaut. That’s one small step for Aftheads, and one giant leap for museum attendees! Finally another hockey game and another win for DU! They are off to the NCAA Frozen Four. Hopefully they’ll do okay in the next round without Afthead high fives. 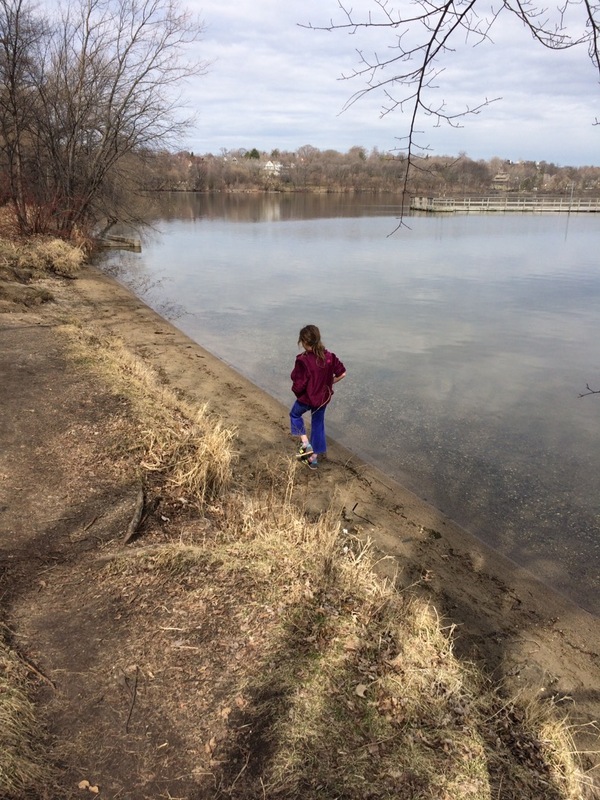 Monday we enjoyed a trip to see Lake Harriet and the memorial bench my husband’s family bought for his aunt when she passed away six years ago. She was one of my best friends, so the visit was sad, but I was glad for the opportunity to remember her with my daughter. Happy Spring Break to those of you who get to enjoy such weeks! It was so much fun, and I was thrilled when we saw the Snoopy sculptures outside of the Science Museum. I have a whole series of photos, but most of them have foreheads featured. Thanks for letting me know these existed in the first place.